Starting with the Archduchy of Austria (1453- +/-1806), that was one of the most important states within the Holy Roman Empire. One of its Archbishoprics was Salzburg (from 1278-1803). Some centuries later, already Austria playing as major role in central Europe, some previous possessed portions of Spanish Netherlands were ceded to Austria, creating the Austrian Netherlands (1714-1797). 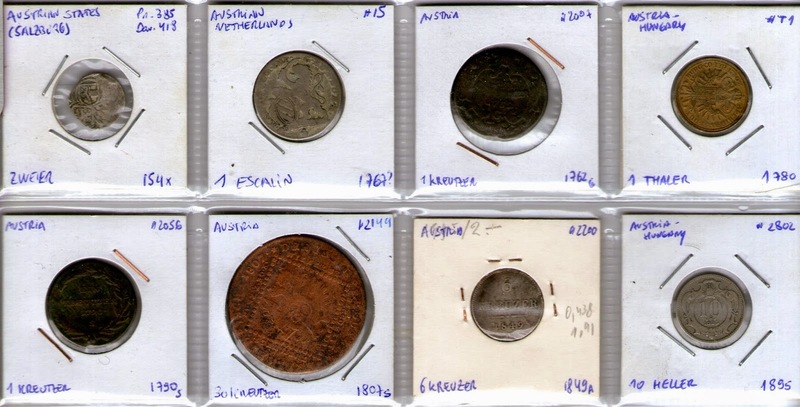 After the death of Maria Theresia in 1780, Austria has been ruled by the House of Habsburg-Lorraine, although the emperors were sons of the previous rulers, Joseph II and later Leopold VII (I have no coins from this one - but from his son Francis II). Francis II adopted the new title of Emperor of Austria, keeping the Archduke of Austria title still, while the Holy Roman Empire has been dissolved. Later then, from 1848 until 1916, one of the longest ruler was Emperor of Austria-Hungary till the beginning of the WW1, Franz Joseph I. Both currencies "Heller\Filler" were used, depending of which territory, respectively Austria and Hungary. 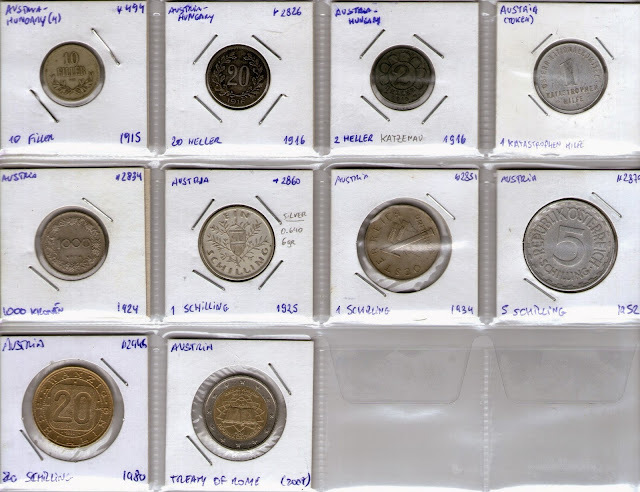 During the WW1 period, two coins are represented. One from emperor Karl I, that died in Madeira. The other is a curious token used in the infamous Katzenau, in a internment camp, from which my research is not enough to provide any relevant information. Another token (undated, probably from WW2), is 1 Katastrophen Hilfe, from which, again, further research must be done. As a Republic, after WW1, Austria started with Krone as currency, later changing it to Schilling - name that went till the adoption of the Euro. 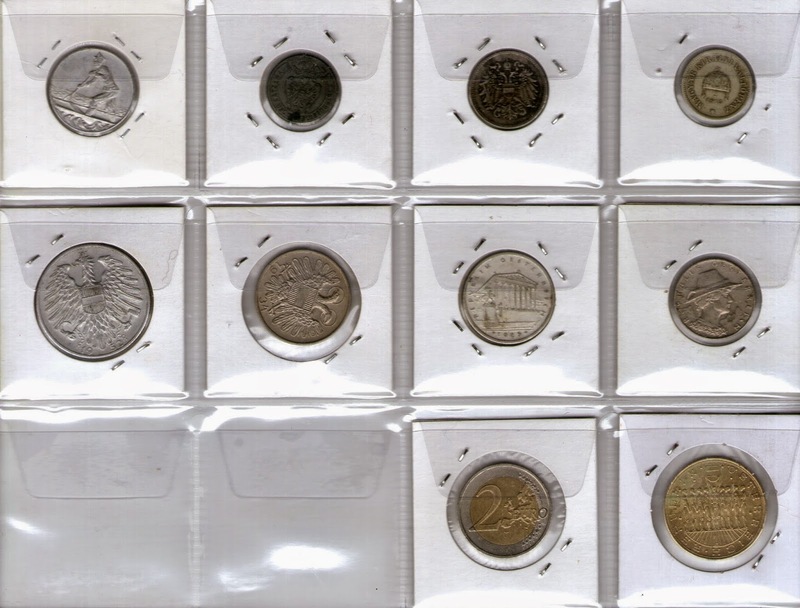 Throughout the WW2, some changes on the coins were operated, although not substantially as in other european annexed or occupied countries. 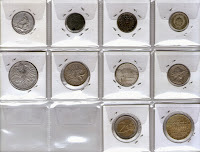 Austria adopted the euro since 2002 and its common issues of the 2 euro commemmorative coins. Disclaimer: This is not intended to be an historical article and it is advised that information might be incomplete, imprecise or subject to other historical or political approaches interpretations. My focus is merely in the coins I own.